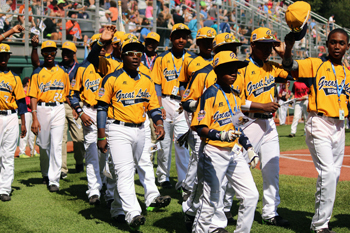 With this summer’s success of Jackie Robinson West and Mo’ne Davis, kids in sports have been in the spotlight. Both the team and Davis remind us why it’s important for all kids to be involved in sports and/or some sort of physical activity. The ability to work on a team is a skill that will literally follow a child throughout their entire life- from grade school all the way through their adult career. Fostering this at an early age is crucial. Families.com tells us that kids who play sports ‘quickly learn that they have to work together as a team to win the game.’ Getting your child on a sports team is getting a head start on this important life lesson. Team sports and activities allow children to also learn about setting goals and achieving them. It may be a goal to try out and make the team at first, and then eventually it could be to ‘start’ in the game, or to improve upon a certain skill. Setting and achieving goals not only instills a sense of discipline in a child, but also the value of hard work. Once those goals become realities, children are also able to feel a sense of fulfillment. These days, it’s not just enough to be a student. College admissions offices are looking for several components in their applicants, according to this article, one of which is an ‘angled’ student, or someone that has a few specific passions, rather than the traditionally ‘well-rounded’ student that dabbles in several different activities. Once a child can hone in on those interests, it will be easier for him or her to devote attention to, and excel in the corresponding sports or activities. Obesity can lead to several serious health issues if it’s not addressed. Kids that are involved in sports are getting regular exercise, and paired with a healthy diet, that makes for a person who will most likely maintain a healthy lifestyle throughout their adulthood. Another benefit of sports is leadership skills. Serving as a captain is great experience, and serves as invaluable practice for leading a group of your peers. As a team leader, a child learns how to communicate with, listen to, and motivate others, which later in life may translate into duties as a CEO of an organization. In fact, this survey of Executive Vice President-level professionals at 75 Fortune 500 companies found that 95% of them played sports in high school. There are tons of other reasons why kids should play sports, but we hope these are enough to inspire you. Make sure your child is involved on a team, and they will thank you later!